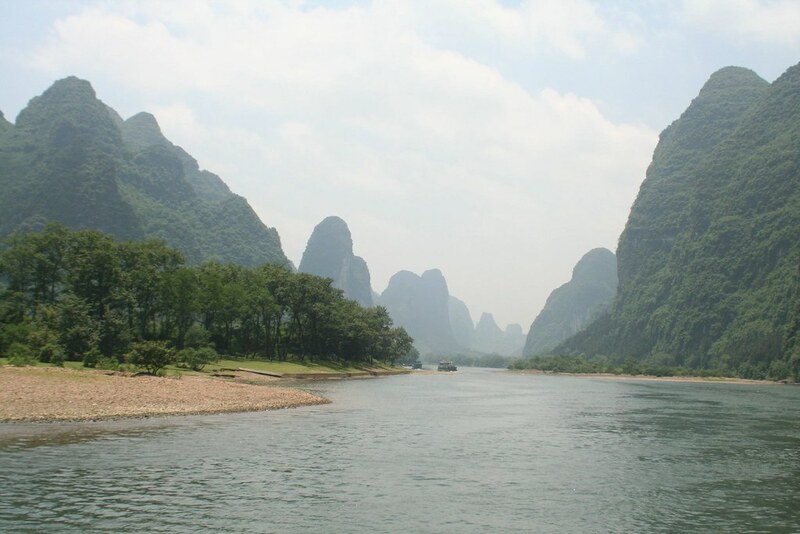 One of the “must do” activities in China is a cruise down the Li River from Guilin to the smaller city of Yangshou. Like all good budget travelers we opted to join the Chinese tour. You get the same beautiful scenery sans the English commentary, but for half the price of the Foreigner’s tour. And of course there is the extra bonus – a cross-cultural experience with 60 Chinese tourists! The river winds it way between the green limestone hills past small villages, terraced rice paddies and cormorant fishermen. Not even the flotilla of 70 or more boats making the journey down the river can spoil the scenery. It’s unlike any other we have seen – simply stunning. Rather than taking the return bus trip to Guilin, we decided to hang out for a few days in Yangshou – a “legendary backpacker hangout.” The city is just as other worldly as the natural beauty that surrounds it. It’s one of those places where we can take a vacation from your vacation. Locals speak English, their are a multitude of food options, lodging is cheap and comfy and there is any number of outdoor activities to choose from. At the same time, like so many other tourist locations in China (as we are quickly learning), there’s plenty on hand for the Chinese tourists as well – karaoke, mini basketball hoops, and loads of souvenir schlock. The main pedestrian mall comes alive with tourists shuffling along buying knock off North Face jackets and Louis Vuitton hand bags while in the background there’s a cacophony of off pitch Chinese karaoke singers, ABBA music, and traditional flute music. The closest comparison we could draw was Bourbon Street – substituting fake handbags and watches for booze. We call it the Disney effect. While we were intrigued by this bizarre place, we weren’t exactly in love with it. But the real reason we decided to stay for a few days was to explore what lies beyond Yangshou. Today we rented bikes and accompanied by a local guide pedaled through little villages and rice paddies taking in some more of the amazing scenery and local life, stopping off for a very steep hike (some 1250 steps – though I didn’t count them) up Moon Hill. Today was the kind of day when I am feel in awe of this experience. For the most part we escaped the masses and enjoyed a little bit of what China has to offer.